We decided to do our Iceland South Coast Day Trip from Reykjavik. 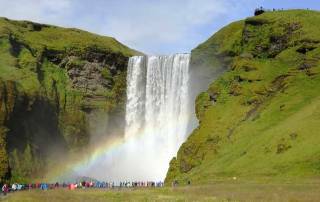 We rented a car from the Keflavík Airport the day before. 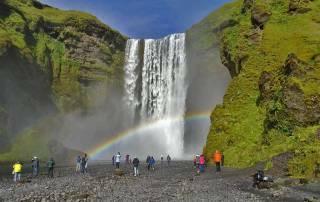 You can expect that an Iceland Coast Island Day trip will take about 8 hours, including stops at Seljalandsfoss, Skógafoss and the Black Sand Beach. 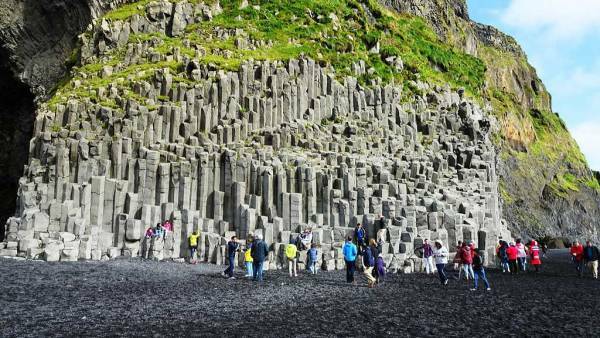 You won’t have enough to time on a day trip from Reykjavík to reach Jökulsárlón lagoon, so plan more than a single day for that excursion. Heading out on our Iceland South Coast Day Trip, the weather as excellent. Skies were clear in Reykjavík. Iceland loves roundabouts, so even though there are no traffic lights on the South Coast, you will find lots of roundabouts. As we drove south, clouds built up over the Eyjafjallajökull volcano and the Mýrdalsjökull icefield in the distance. Off shore, the Westman Islands were clearly outlined against the sea and the blue sky. 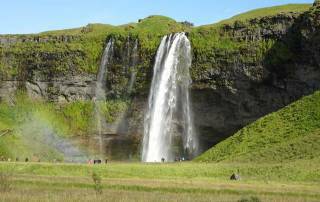 After about two hours of scenic driving we reached Seljalandsfoss. 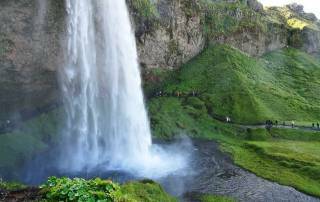 The Seljalandsfoss waterfall is easy to find, because you can see it many miles before you get there. 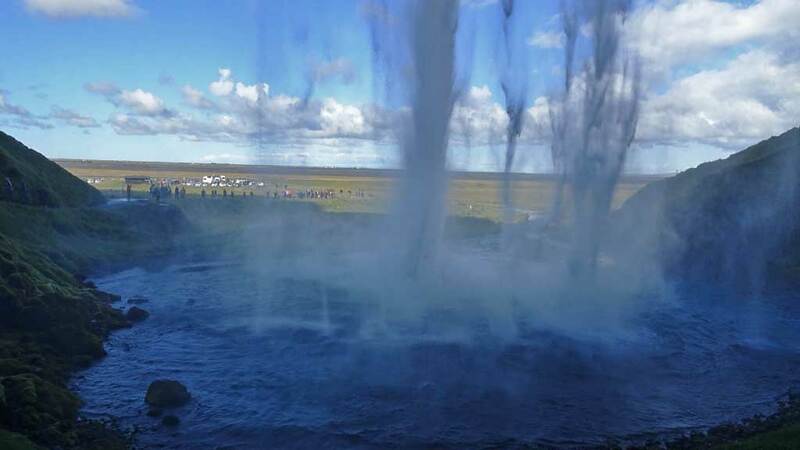 The waterfall is only a few hundred yards off the main ring road highway and nearly every car turns off to see it. The parking lot was full, so we drove past until we found parking along the road. 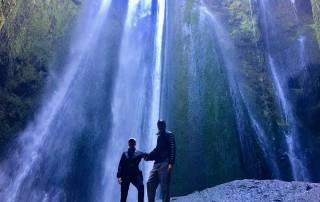 The falls are a very short walk from the road. 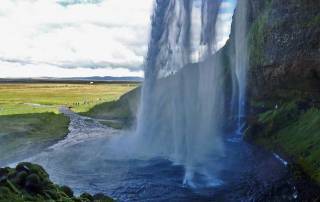 The best part about Seljalandsfoss is that you can walk all the way behind the waterfall and come out the other side. Be prepared to get wet though. 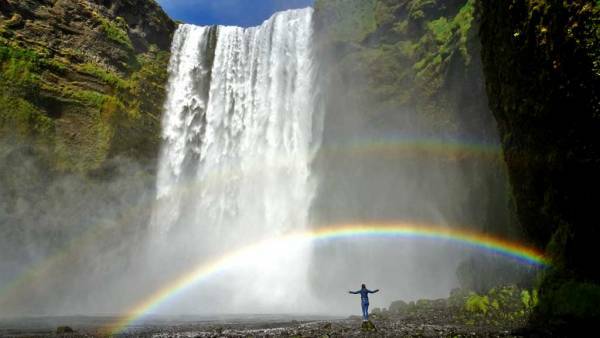 The longer you stay to take pictures, the wetter you will get in the spray. 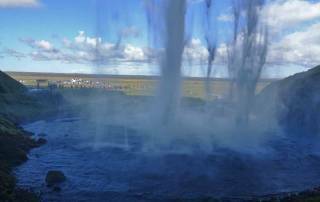 The view is marvelous from behind the falls, as you look out on the flat plains through the mist. The walk behind the falls is not steep or dangerous, but you will have to share the experience with lots of fellow tourists. 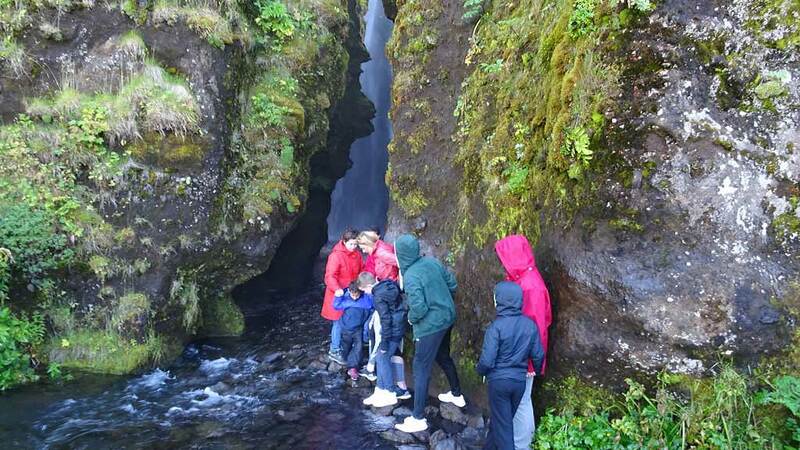 After visiting the main waterfall, we walked along the base of the hill past a couple of smaller falls until we came to a small tight gorge with a small river flowing out of it. 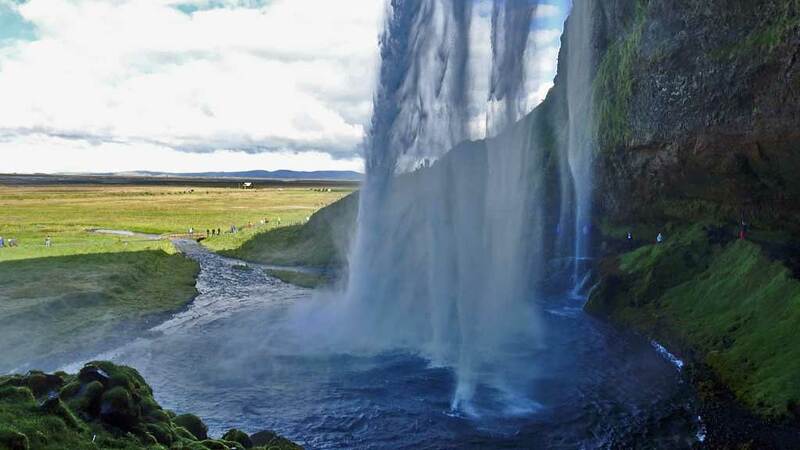 This is Gljúfrabúi cavern waterfall. Rocks had been placed into the stream so that you can walk up into the cavern waterfall. 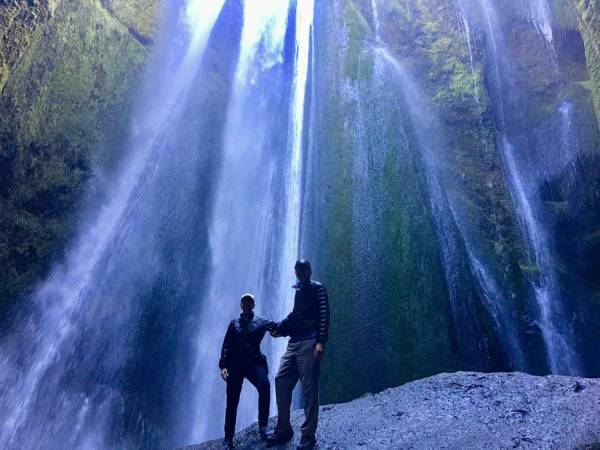 Getting to Gljúfrabúi cavern waterfall is a challenge because it’s hard to keep your balance on the rocks and there is a steady flow of tourists. The foot traffic on the stones in the creek is one way. You can wait quite a while for your direction to gain control, but it’s worth it. Looking up at the cavern waterfall up close is a great view. 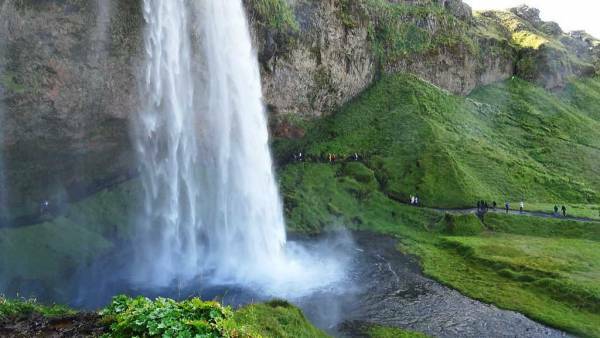 Our second stop on our Iceland South Coast Day Trip was Skógafoss. 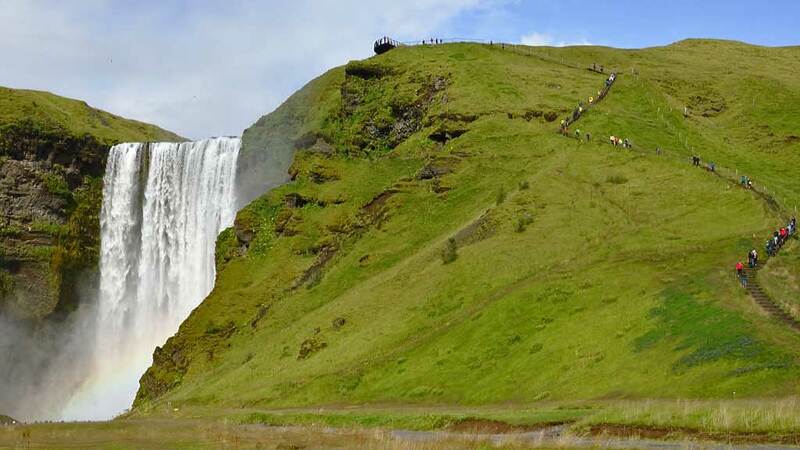 The Skógafoss waterfall is only about 15 minutes from Seljalandsfoss, but the landscape is completely different. The foothills hug the coastline and the weather changed from sunny to rainy. 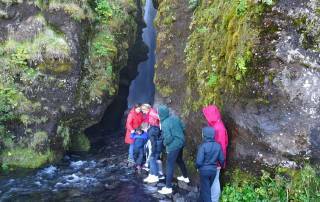 Strangely, we caught glimpses of the Eyjafjallajökull glacier in blue skies through the rain. 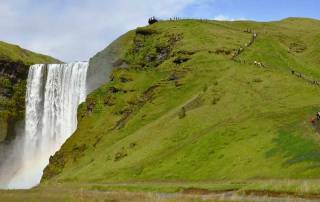 The Skógafoss waterfall is an impressive view from the highway as you approach. The parking lot was packed with tourist rental cars. 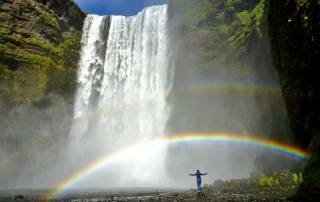 The rain fell so hard that we opted to postpone visiting Skógafoss, because we were hoping for better weather on our way back from our South Coast Day Trip. 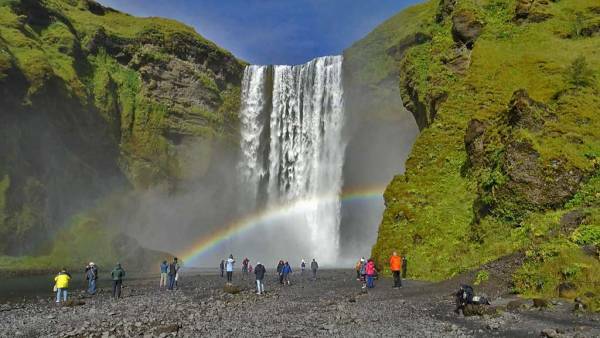 We were very lucky on our return visit to Skógafoss. The clouds opened up to create a sunny day about 5 minutes before we arrived. 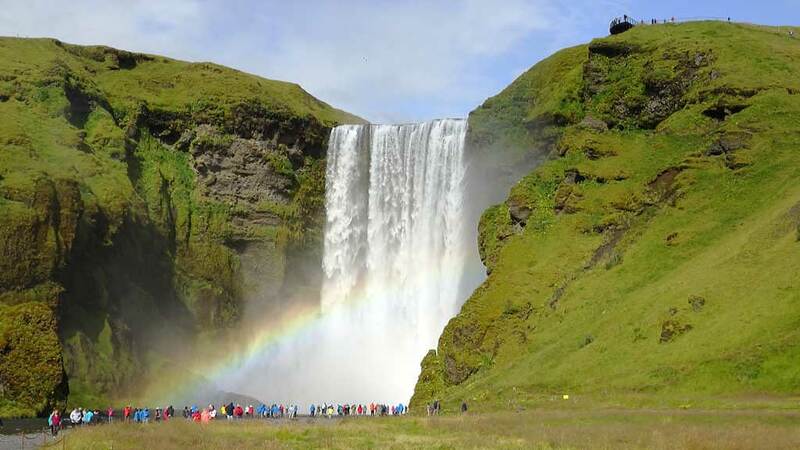 We walked up to the base of Skógafoss in bright sunshine. The sun produced a magnificent double rainbow over the falls. By the time we returned to our rental car, the weather clouded over and the rain returned. We were very lucky. 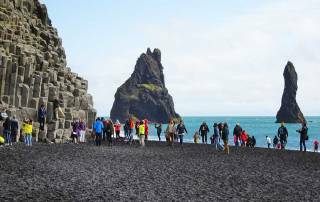 The third stop on our Iceland South Coast Day Trip was a visit to the Reynisfjara Black Sand Beach. The weather was pouring rain along this section of the South Coast. The rain drenched us on the very short walk to the lava columns. The steep islands towering offshore were hard to see in the rain. The Black Beach Restaurant was a safe haven. The restaurant was full up with tourists. 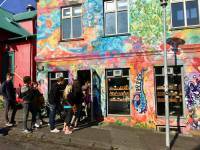 The restaurant prices are the same as everywhere in Iceland – expensive. The Black Beach Restaurant has nice large windows with great views out over the beach. After lunch at the Black Beach Restaurant, we were lucky to get a sunny break. 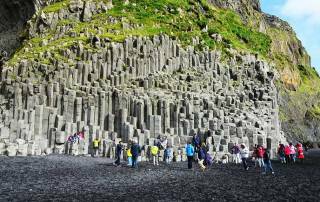 We took the short 3 minute stroll back to the lava columns. The seas around the islands had turned blue in the sun. In the sunny break, birds were flying along the cliff edges above us. Someone beside me excitedly pointed out a puffin speeding by above us. We spent quite a hike spotting puffins, while most of the people around us showed no interest in them. Puffins are quite small, with a heavy main body. Just like ducks, they have to flap their wings fast and move quickly to stay up in the air. So it is easy to spot them among the other birds flying along the cliffs. Seeing puffins in late August was a bonus for us, because puffins leave Iceland before the end of August to get away from the cold weather. The return trip to Reykjavik is a long ride. 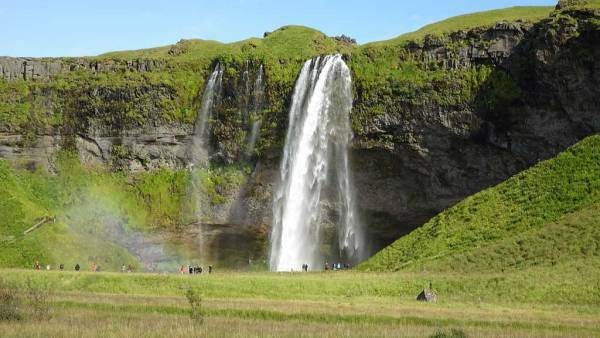 Fortunately we were able to stop at Skógafoss and Seljalandsfoss again to enjoy them both in the sunshine. 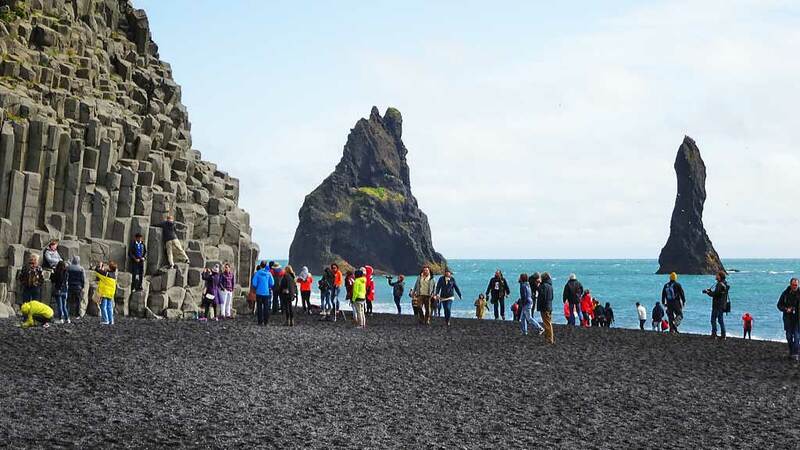 Our Iceland South Coast Day Trip was wonderful.